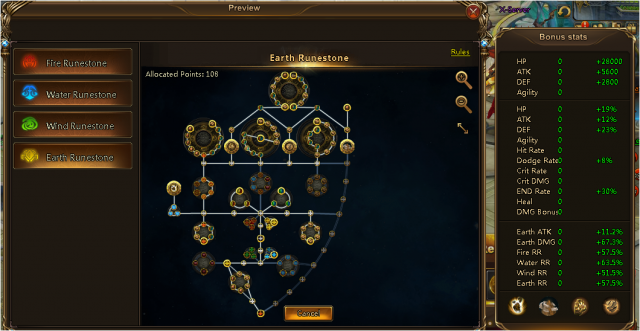 Runestone system has provided four kinds of mystic elemental power. Whoever masters the power can be invincible in the battlefield. 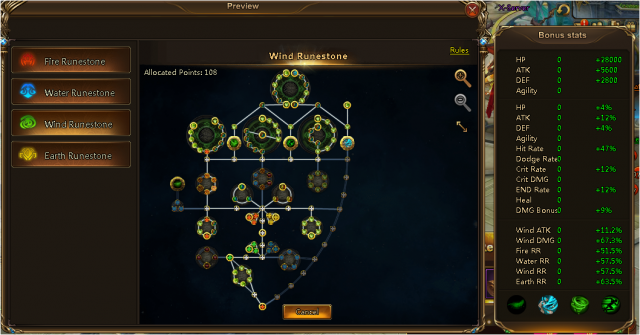 Here is a strategy about how to stimulate the real potential of the Runestone System. 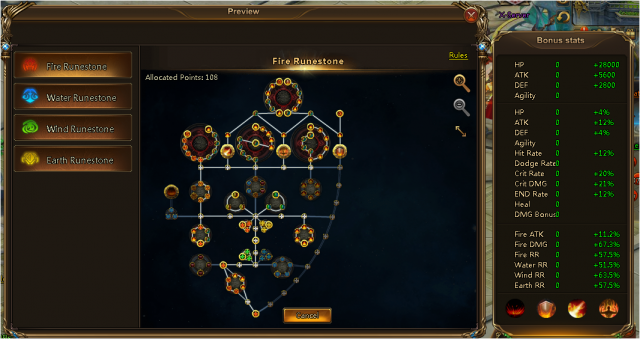 The following Inscribing map is the optimized choice for the hero with the recommended Elemental Runestone in PVP battle mode. Actually warriors can flexibly change the Inscribing map and elemental Runestone according to different enemies’ stats configurations. All the inscribing maps are on the premise that all the 108 Inscribe Points are available and Inscribe Crystal and Inscribe Marking are sufficient. If your Inscribe Markings are not enough to activate all the upper 13 nodes, nodes which offer Crit, END, Hit, or Dodge should take priority. The priority should be based on your cultivation direction. Final Inscribe Nodes (which provide special attributes and skills) > Elemental ATK, DMG, Resist > Hit, Dodge, Crit, END > certain percentage of HP, ATK, or DEF > certain fixed value of HP, ATK, or DEF. Elemental Penetration can provide a massive damage buff and since this attribute is rare, everyone should activate it first. Elemental Resist can reduce all elemental damage this hero receives, and it should also be activated. Meanwhile, since some Inscribe nodes provide different kinds of Elemental Resist, you can choose which kinds you need to activate first when dealing which different enemies. In PVE mode, you can adjust Elemental Resist attributes into basic attributes like HP, ATK, and DEF to strengthen your attack or survivability, which can help you win the battle. 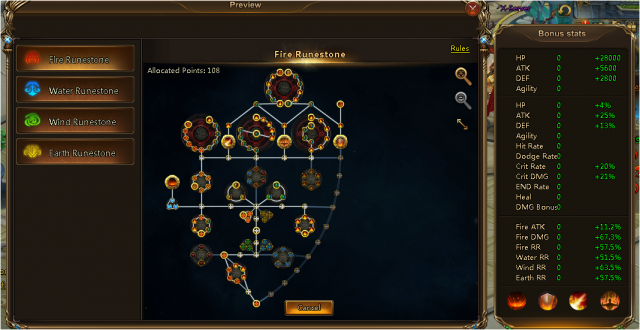 Fire Runestone is suitable for DPS heroes or heroes who don’t have a immunity ability and need Flame Avatar, one of Fire Runestones Inscribe Skill, to make up for its lacking resistance to controlling skills and weakening effects; Xros Flame, another Fire Runestone Inscribe Skill, can increase the attack ability when normal skill is not released on this round. Aphrodite can cause massive Crit damage, and if her skills score a critical hit, she will gain extra effects from them. Fire Runestone can offer double judgment on Crit Hit, and can greatly raise Crit rate and Crit DMG; Flame Avatar raises up Aphrodite's resistance ability and thus making sure she has a chance to release her ultimate skill. 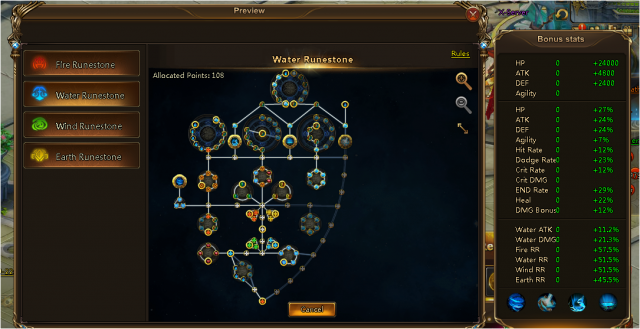 Water Runestone can add a great healing buff, which can be used to strengthen Healer heroes’ skills. Water Oath, one of Water Runestone Inscribe Skill, can heal the entire squad and increase their ATK and DEF when the hero dies, which can provide a wave of strong power for the remaining DPS heroes. Great Fire Resist rate and Whirlpool, one of Water Runestone Inscribe Skill, grant the Water Runestone great pressing force on heroes using the Fire Runestone. If your enemy is going strong on Fire Runestone, you can utilize the Water Runestone to deal with him or her. 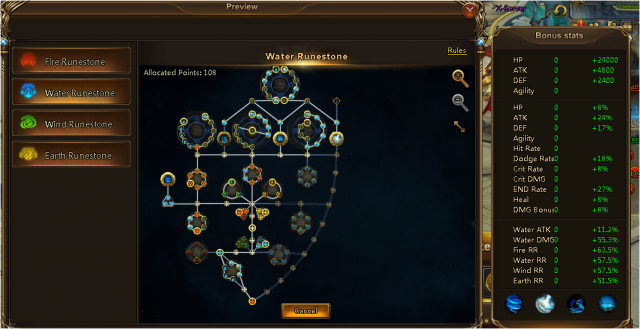 Besides considering Pure Water’s special skill attributes, another Water Runestone Inscribe Skill, HP Inscribe Nodes should take priority when lighting up nodes. Isolde has good Damage bearing and Resist ability, but her Damage attribute is gradually increased, which means in early stage her damage is not powerful enough. Water Runestone is a good choice to increase her HP and surviving ability. Flora’s repeated healing ability can be strengthened by Water Runestone attributes. Meanwhile her passive skill can combine with Water Runestone attributes, which can help her bear massive Crit Damage. Thera can gain double buff effects, and if combined with Water Oath attributes, her buff can be stacked into four buff effects. 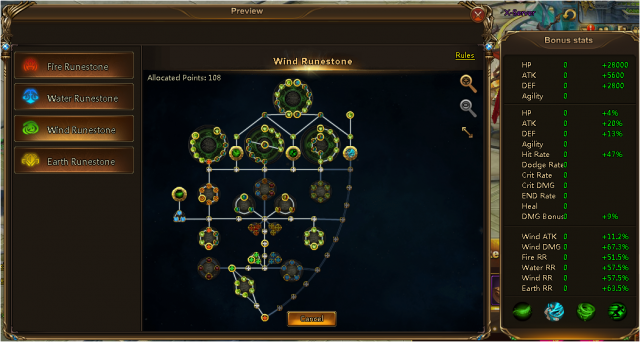 Wind Runestone perform well in PVE mode, and less impressing in PVP mode. Zephyr, one of Wind Runestone Inscribe Skill, can make the hero immune to Rage reducing effects and can reduce enemies Rage when dealing damage. Based on the premise that the hero can stay alive in the early stage of the battle, Whirlwind, one of Wind Runestone his Inscribe Skill, can greatly improve his or her attack ability at the later rounds of the battle. Tailwind, another Wind Runestone Inscribe Skill, can provide a regular Damage buff for Soul Arms or Heroes which can grant shield for heroes, such as Titan Grip, Rei, Aphrodite. In PVE mode like Grand Tournament, when fighting against some Bosses who have high Dodge, shield or Rage reducing effect, warriors can try to utilize Wind Runestone to vanquish the enemy. Earth Runestone can provide massive HP and DEF attributes, and it can gain an attack buff from its defense attribute. It is perfect for heroes with high DEF. Absolute Defense, one of Earth Runestone his Inscribe Skill, can improve hero his attack and HP when his or her HP is low. Rock Guard, another one of Earth Runestone Inscribe Skill, can guarantee Basic attack to hit and the basic attack can reduce target’s Dodge, which is effective in fighting against heroes with extremely high Dodge. Rock Guard can fully activate the potential of an effect that rely on basic attack. A’ishah can be graced with Spectral Tiger, and earth Runestone his Rock Guard skill can make her basic attack hit, and in this way each basic attack can absorb 400 Rage from the enemy. When Lulu’s HP is running low, Rock Guard can help raise her attack ability; Lulu’s passive skill can gain Damage Reducing (DR) effect; Combined with the mount Primal Dragon’s skill which can give a great attack boost. In this way, Lulu has chance to strike back. When Alecta’s HP is running low, her normal skill Damage can be improved greatly, and if the skill kills the target, it will trigger again next turn and the Damage will be raised. Warriors can first reduce Alecta’s HP to gain more damage, and then fight back to smash the enemy. Adjust your Runestone strategy in different situations and make full use of this mystery elemental power and you will become an invincible hero in LoA2 fantasy world! 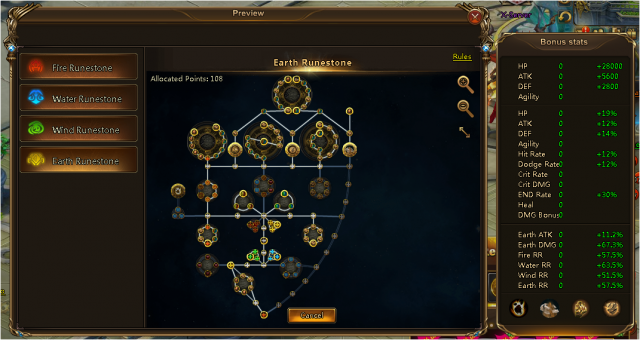 Next：Harness the Unlimited Power of Elemental Runestones!